It is made of eucalyptus leaves on 70 % ethyl spirit. 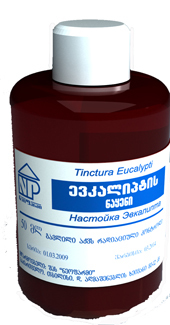 Contains a complex of biologically active substances: essential oil (80 % zineol), organic acids, tannic and bitter substances. Has anti-inflammatory, bactericidal, poorly sedative and expectorant effect. Operates on gram-positive and gram-negative microbes, fungi, the elementary, golden staphylococcus, Escherichia, tuberculosis mycobacterium, amoeba causing a dysentery, trichomonads. For rinsing of 10-15 drops on 1 glass of water. 50 ml of tincture in orange bottles from glass and a polymeric material. Term of validity: 5 years. Georgia, Tbilisi, David Agmashenebeli's avenue, 12th kilometre.